squire: A. The “visual look of Moria”: how did this painting influence Jackson’s ideas about the cavern sequences that we have been discussing all week up to now? Darkstone: Well Vast spaces that go on and on into darkness. Very reminiscent of deep, cool Carlsbad Caverns. Much better cinematically than the hot closed in spaces one might normally associate with mines, or the cramped natural fault caverns of San Marcos. Good inspiration for thinking outside the box. Elostirion74: I cannot comment very specifically, although I see that Jackson liked the concept of high and wide spaces for the journey through Moria. I like the look of the Dwarrowdelf in the movie, but I'm not very impressed by how Jackson tries to make the audience over-awed. squire: B. Do you like this rounded, arched style more or less than the angular style adopted for the films? Would this style have “held up” in representing the dwarves and dwarf-culture in the films? Finding Frodo: infinite hall I love Dwarrowdelf in the movie. 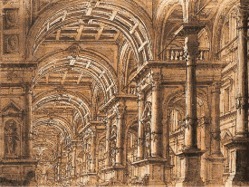 The angular pillars, decoration and arches seem much more appropriate for the dwarves than the rounded ones in Lee's original illustration. Why? Maybe it relates to the appearance of the Dwarvish runes, or it seems fitting for the (mostly) male society, or just as a contrast to the Elvish style. Darkstone: Too much like a gothic cathedral. The angular style gets away from those associations and allows one to get a feel of Dwarrowdelf without other competing connotations. squire: Your response Too much like a gothic cathedral. The angular style gets away from those associations and allows one to get a feel of Dwarrowdelf without other competing connotations is perfect, IF one believes that Middle-earth is not essentially a European universe. 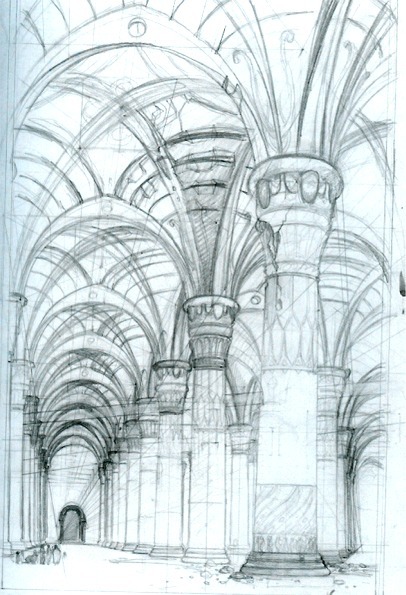 What I like about Lee's initial sketch is he takes a kind of well-known and conventional cathedral architecture (though not Gothic, by any means), and stretches it in two directions instead of one. Though neither literally infinite nor particularly "fantastic", to me the result is the oddest thing; and aside from Karnak, becomes unique and exotic without ever leaving the real. Add that it's underground and carved from living stone, and I think it says all that has to be said about Moria, and the Dwarves. In the film, although I appreciated as an artistic concept the angular, primo-Deco style the designers developed, I never felt it was necessary to make Dwarvish culture "unique" - what's unique is that they built an entire civilization under a mountain. So it's all a matter of preference, which is why I asked what everybody's "fantasy/reality" index is. Mine, of course, tends to be on the reality side of the scale. Darkstone: But Dwarves *are* unique. In all of Middle-earth they are the only living creatures *not* created by Eru. They are indeed strangers in a strange land, and so their architecture should reflect that alien-ness. Darkstone: Glad he's not an architect, especially here in the South. High ceilings allow heat to rise. Mines are very hot. Therefore an excellent way to keep a deep mine cool would be very high ceilings and huge open spaces. squire: C. Is Lee suggesting any connection between dwarves’ short stature and all male society, and this gigantic hall filled with immense columns? Darkstone: Hmmm.... I don’t see him suggesting anything like that at all. As he said, if anything it suggests that there is more to Dwarves than meets the eye, especially vis-à-vis their creativity. And the gigantic columns suggest a stone forest, which foreshadows the Elves’ Lothlorien with its forest of gigantic Mallorn trees. And then there's the Numenoreans’ gigantic Argonath. We don’t immediately assume Elves or Men are overcompensating via these structures, so why make the assumption about Dwarves? Such seems motivated purely by anti-Khazâdism to me. 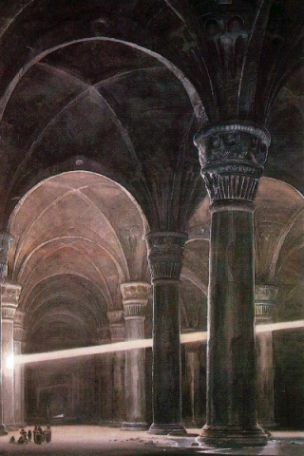 squire: What’s interesting to me is that the filmmakers, from Lee to Jackson to the effects crew, rejected the idea of this great hall of Moria being a standard basilica, i.e., a linear hall with two lines of columns down the center supporting a central nave. 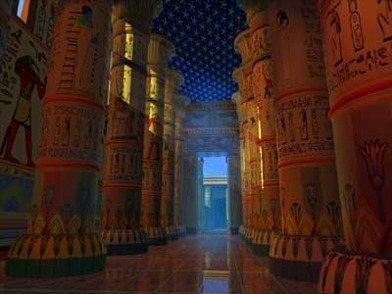 Instead, from Lee’s painting to the final CG construct, the model they adopted was a kind of imaginary infinite hall, with columns receding endlessly in every direction. “Pictures with a major architectural element need a highly structured perspective drawing as a framework. Once that’s in place, I can take a more relaxed approach to working on the final watercolor, knowing that there is a strong foundation underpinning it.” – Alan Lee, The Lord of the Rings Sketchbook, 2005.
squire: D. Can you identify the changes Lee made in this version from the one that inspired Jackson in the first place? Can you identify elements in this version that didn’t make it to the final film version? What process is going on – and how does it relate to the script and the goals of the film? Finding Frodo: I also prefer the way the movie hall seems truly infinite. 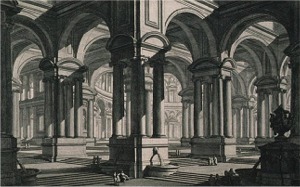 In the original illustration there does appear to be a doorway off in the distance, but here the pillars really do seem to go on as far as you can see. Darkstone: It seems like as they added detail to the script, they added detail to their backstory, which moved the designers to add detail to the sets, which inspired the scriptwriters to add to the script, which... Well, you get the idea. A wonderful synergistic spiral. E. There’s no Egyptian influence in the film’s architecture, but do you think there is any connection here between the Dwarrowdelf and Karnak? Darkstone: If anything I see the connection as being with the Great Masque of Cordoba. A magnificent structure of old that’s been intruded upon by an ancient enemy. squire: Well well Your response If anything I see the connection as being with the Great Masque of Cordoba. A magnificent structure of old that’s been intruded upon by an ancient enemy. is intriguing to me. 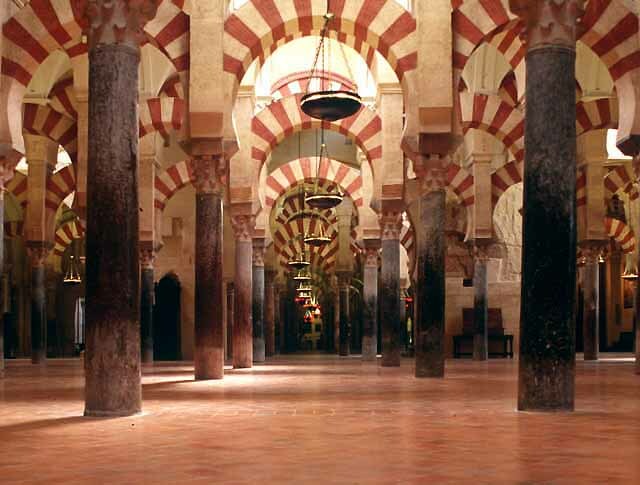 Cordoba is, of course, the other great example of a hypostyle hall in classical architecture. 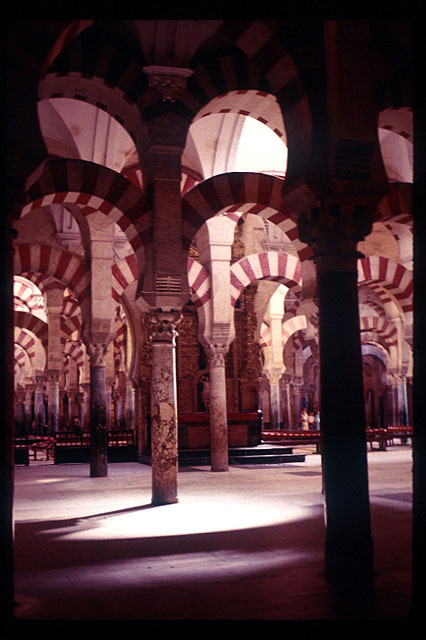 I didn't want to bring it into this discussion because the formal relationship to the film's Dwarrowdelf is quite poor: Cordoba's columns are thinner and more widely spaced, and the low and elaborate ceiling arches and beams dominate the columns, proportionally flatten the space, and orient the room into a series of aisles. 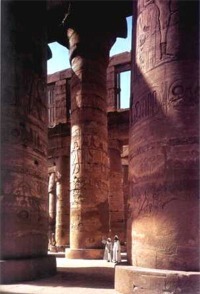 On the other hand, because the number of columns in both directions is greater than that of Karnak, the "infinite" illusion is a little closer to the film. So you're certainly right there. Of course, Cordoba is nowhere near infinite, and one can see the walls that end all the perspectives quite clearly. When I said "unbuildable because infinite" I meant literally infinite, as only drawing or CG can make possible. With all due respect to the builders of Cordoba, of course. As to the 'intrusion of the ancient enemy', well, I just don't see it when I look at Cordoba, no matter what I know about the history of Iberia. I think an equal argument can be made that the gigantism and proportions and darkness of the Dwarrowdelf set do refer to the Egyptian mortuary temples and their indelible association with Ozymandias' deadly boast "Look upon my works, ye mighty, and despair!" Darkstone: But drawings or CG, just like Cordoba, can only give the *illusion* of infinite. It didn't even cross my mind that Dwarrowdelf was intended to *be* infinite. Then again, maybe it *was* infinite during the First and Second Ages, before the world was "bent". RoyBatty: Istanbul For me personally the scene always reminded me of the sunken cistern in Istanbul (called Yerebatan Saray and well-known from the famous movie Zorba the Greek). squire: Cool! What a great image. Makes me wish Jackson had found a way to show us the parts of Moria that were "drowned deep". squire: F. "Goes to infinity in every direction…" Do you find it works beautifully, or do you find it slightly annoying, like being in a barbershop with mirrors on both walls? Darkstone: I think it works beautifully, just like Cordoba. And I like the mirrors on both walls thing. I especially liked it in Citizen Kane. squire: Does the fact that it is impossible to actually build such a space in real life or in miniature, so that it must be “drawn” in 3-D by computer (as the early theater artists “drew” impossible spaces on their 2-D backdrops) come across when you look at these scenes? Finding Frodo: Why would the Dwarves build a hall like this? I have no idea. It would take forever, and what could you do in a hall like that? Maybe that's what some of the characters were thinking about. It's so majestic you'd be too awestruck to ask questions. Sam's comment gives voice to everyone's thoughts and relieves the tension of the silence. Thanks for the great discussion this week, squire! weaver: thanks for the beautiful artwork... I love the "majesty" of this great hall, in all its incarnations. It was very interesting and enjoyable to check out all the art work you posted and how it all related to the final product we got on screen. Thanks. The most impressive thing to me about Moria is that none of it actually exists. They made me feel like they actually filmed it in a real place. Darkstone: “Impossible”? Tell that to the builders of Cordoba! squire: And how did you score on the fantasy/reality preference question earlier in the week? squire: G. As before, Jackson makes the entire design of a major element of the film a personal, gut thing. Is that the way it should be? weaver: As far as Jackson and the actors go -- well. Jackson has a well honed "gut" sense of what makes a good movie, to him, based on years of experience. That kind of "gut" feeling I don't have a problem with. And Jackson making a version of LOTR to "please himself" at some point also doesn't bother me. That's what Tolkien did, too, in writing it. Darkstone: Absolutely. Imagine how awful it would have turned out if he had made it by committee!! As it is, one vision is more like to produce a unified whole. It’s really amazing how many of my favorite works of art were made by people who just wanted to produce a film or write a book that they would enjoy. And really, in the words of Ricky Nelson, you can’t please everyone so you got to please yourself. well he's back: as to PJ making major decisions "from his gut", well sometimes they worked great (Moria); sometimes not (Denethor's leap). I'll cut him a lot of slack. Elostirion74: It's difficult to see how it could be otherwise, although I wish Jackson was able to vary the structure of his scenes more or use other elements to build suspense/awe etc. At least his approach on every setting in the film was very accomplished. squire: H. What is the effect on the film’s tone of the rhythm between the Toon-town caverns of the Journey in the Dark, and the Cartesian nightmare of the Dwarrowdelf hall? Would the transition feel the same if we had not had the interval with Gandalf and Frodo to separate the two? Darkstone: Dwarrowdelf signals the beginning of the action, the climax of the Journey in the Dark. The transition with Gandalf and Frodo provides the secondary personal element. Of course, many would prefer it reversed. The best thing about this scene is one that you omitted: The music! This theme is so perfect. And as far I can recall it is the one and only time it's used in the three films. PS - yes, the interlude between Gandalf and Frodo makes the transitions between spaces flow better. and isn't Mckellan just so extremely perfect as Gandalf the Grey here. Elostirion74: the music - is it right for this scene? The music is meant to be beautiful (and it is), but it deviates too much from the rest of the music in Moria and it serves to create and set up your own emotions rather than complement them. Elf_Maven: Oh, yes, I forgot to comment on that aspect. You both captured and reinforced my thoughts exactly. weaver: late comment on this post... I've been listening to the FOTR extended soundtrack today, and it hit me that the Dwarrowdelf music and imagery brings the sense of "melancholy" to the films that I associate with Lorien in the books -- the walk through the hall is like a view back in time, about a world that has faded away. squire: Definitely a 'melancholy' theme in the Moria score Oh yeah. For sure. The long stretched out minor chords as the company trudges through the Mines convey more atmosphere than the overlit sets, as far as I'm concerned. The funny thing about the use of 'real' dwarvish, translated from Boyens' lyrics, is that the message of the lyric is relatively upbeat. The dwarves (the chorus) are singing the praise of Durin, and foretelling his return, his conquest of Death. But we never hear the words (and couldn't understand them anyway). We do hear the music. And the music conveys the opposite emotion: mourning, loss, depression, darkness, death, amidst a lost magnificence. Boyens wrote of resurrection. Howard Shore took his orders from Jackson, not Boyens: "I want to hear the thousands of dead souls that died to dig out this Mine" is roughly how Jackson put it. It's just as well they didn't apply subtitles to the Journey in the Darkness, or the audience might have become confused as to how they were supposed to feel! As it is, though, I think the unintelligible choral music is the real mood-setter in these scenes. 'Gandalf leads the Fellowship into Dwarrowdelf, and Shore’s music expresses the sad beauty of the fallen city. '...the score pauses for a heartbreaking moment of introspection. Frodo is presumed dead at the hands of the troll, a pathetic creature who threatened the Fellowship out of fear and confusion. With a sorrowful jolt, the members of the company realize that their quest will not be victimless. I didn't recognize this as the same piece, although it has that same melancholy quality. I guess you have the Annotated Score, but for anyone who hasn't yet bought the complete recordings (like me), it's available to download free from the official site. Aerin: BTW, for those who have not bought the complete recording of the FOTR soundtrack, the liner notes are not the same as the "Annotated Score"; both are great resources. squire: Gimli, Boromir and Sam react to the great hall how? Darkstone: With wonder and awe. Gimli’s is especially nice as it echoes Aragorn’s at the Argonath. Plus of course we don’t have Gimli's episode with the Mirrrormere, so this has to do as a stand in. Elf_Maven: Gimli's gasp of awe and wonder did nothing to help me appreciate how awe-full and wonderful this cavern was intended to be. In fact, probably the opposite. Perhaps if the Fellowship had been crouching and squirming through tight places in the dark instead of already having been shown to be in vast, high-ceiling caverns; or if it hadn't seemed as if they'd started down a corridor from the door Gandalf chose and immediately entered the hall; or . . . what else? I don't know. I suppose if I stood in the midst of the real thing, I might have had a sense of wonder, but in the movie, it was just a set. Squire, with your past theatrical experience, perhaps you could suggest what might have "worked" for me here? squire: Why does Sam suddenly get a line? weaver: As far as the characters go here -- I remember doing the Old Forest discussion in the Reading Room and was surprised to realize that Sam isn't mentioned in the chapter until the attack by Old Man Willow -- when he's the only one who doesn't get caught. I guess in book or film you can't show everyone's reaction all the time. I liked him getting a line here. Darkstone: He’s everyman, the audience. Elostirion74: Sam gets a line because he's the everyman and his line is taken straight from the book! squire: Does his humor punctuate or puncture the effect of the great hall? Darkstone: His child-like wonder seems to augment it. Like going to the museum and observing the reaction of children to great works of art. Wonderful! Of course some people are so stuffy and snooty they feel the unguarded and heartfelt reactions detract from the art, but those folks are more to be pitied than scorned. Elostirion74: I don't agree with Darkstone that awe neccessarily means (innocent) childlike wonder, awe can be something more quiet and still be no less heartfelt. For me a different music and different looks from the actors would convey a deeper sense of respect for the dead culture of Moria, one I felt more strongly in the opening shots of journeying. squire: Why do we never see Legolas react to anything in this chapter? weaver: Legolas comes off pretty well later in terms of his reaction to both the cave troll and the Balrog, so I guess I didn't miss him here. Darkstone: He seemed to have a grudging reaction to the mithril mine. Otherwise, one might think either that Legolas is being saved for the action sequence, or else Bloom's reaction shots were so wooden as to have been unusable. I'll vote for the former. squire: And why did I forget about the actors? Darkstone: Something in common with Alfred Hitchcock? Elf_Maven: I wish I could forget about the actors. I just detest it when I'm "told" how I'm supposed to react to something, through music, sound effects - or overacting. Elostirion74: I suppose you forgot about the actors a) because you're more interested in the architectural aspects of the scene and b) because there's not much acting in this scene and not much for the actors to do in "a journey in the dark" in general. My feelings on the actors: they're just over-acting, I feel very much like Elf Maven, luckily I can forget about the actors very quickly.